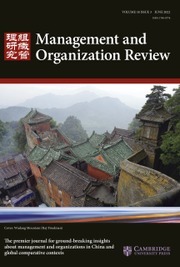 Management and Organization Review (MOR) aims to be the leading edge journal for advancing management and organization research with a contextual focus on China and all other transforming economies. MOR is a far reaching multidisciplinary social science journal that seeks to publish papers that test theory, develop indigenous theories, explore interesting phenomena or research questions, replicates prior studies always in the context of transforming economies. MOR welcomes papers from diverse social science disciplines such as organization behavior, organization theory, strategic management, economics, economic geography, innovation theories, anthropology, political science, cross - cultural, and social psychology, international business, sociology, cognitive science, and institutional theory.